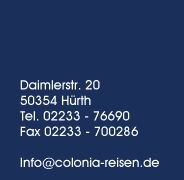 Since 1925, Colonia GmbH is a family-owned enterprise. Coaches with 8 to 60 seats are at your disposal. Due to our obliging service and polite bus drivers a safe travel in a relaxed atmosphere can be ensured.